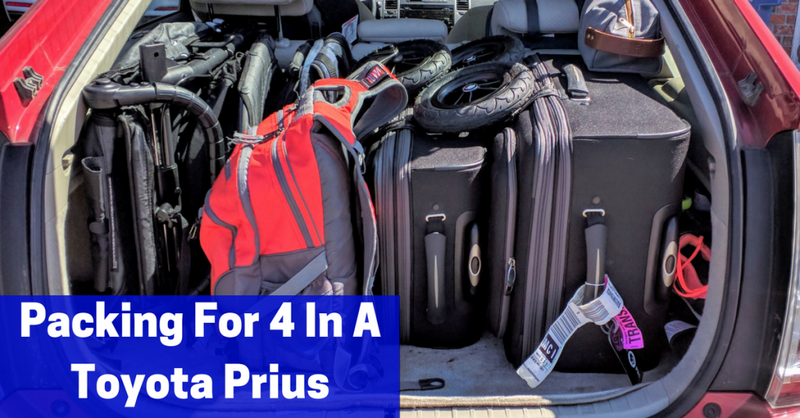 To read more about Packing For 4 And A Dog In A Toyota Prius head over to Traveling Dad! A good packing job can make or break your road trip. Without it, you might have to leave some precious cargo at home, and I am not talking about the kids. You might end up leaving the dog, a suitcase, or even a stroller at home which can make your road trip a disaster waiting to happen. When you are limited to the 14.4 cubic square feet of a Toyota Prius though, it can make packing interesting. Add in a dog that takes up some of that cargo space and things become even tighter. But there are hidden areas in your car that you can use to help make sure that you can bring everything that you need to make your road trip a success. Want to know how I can pack a car seat, stroller, baby, toddler, two adults and all their stuff into a Toyota Prius? You can read about it here.